I have been taking photos since I was about twelve years old, most of that time fairly intensely. I made the choice a long time ago not to become a professional photographer, mostly due to the poor pay and working conditions, and the common inability to choose what you want to shoot, but have retained it as a passionate hobby. In 2001 I moved from film to digital photography, and I cannot imagine going back. 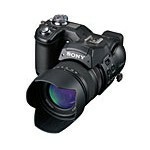 the instant review capability, the dynamic range and high resolutions thoroughly improve on the film experience. There is still an indefinable film look which B&W digital can't completely match, however. I have owned the following cameras, in chronological order: Olympus OM2n, Olympus OM4, Hasselblad 500C, Nikon CoolPix 990, Sony DSC-F828, Canon EOS 5D, Leica M8, and the Contax 645. I keep a photoblog here. The M8 is a really great camera, and the only way I can imagine selling it is if a full-frame M9 is announced. However, it is only a 10MP camera, and since you look through a separate viewfinder rather than the lens, macro, tilt and shift, and tele shots are all very unnatural or impossible. For this reason, and due to the greater resolution and dynamic range, I have decided to add a Contax 645 with a digital back. The Contax has been discontinued, but is very popular, and for various reasons, I decided against its competition. I have so far picked up a body with both waist-level and prism viewfinders, as well as the 35mm f/3.5, 80mm f/2 and 120mm f/4 Macro lenses. Additionally, I have bought a Hartblei 45mm tilt and shift lens, and an Arsat 30mm fisheye. The latter two lenses were not expensive, and were more to experiment with. I still do not own a digital back for the system, but I am saving for it. At this point, I think I will likely end up with the Sinar eMotion 54 LV, which is a 22MP back, with very high image quality. The price means that I have to save for a while first, though. I decided that I was missing a portrait lens for this camera, and the 140mm Contax 645 lens doesn't enjoy the most solid of reputations, so when I found a Hasselblad 110mm f/2 for a good price, I jumped on it. It can be used on the Contax 645 with an adapter. Gorgeous lens. My quest to reduce the weight of my 5D kit, which started by selling the big zooms and buying smaller primes, and continued with selling the 250mm for a 180mm eventually culminated in my realising that the kit would never be light enough to comfortably carry around. The camera and lenses are simply too big for that. Even the camera with just two or three of the lenses put a strain on my back after a day of walking. My trip to Egypt really made clear that I was never going to be happy with this compromise. Thus, I sold the 5D and all the lenses and accessories I had so carefully chosen, and spent the money on a Leica M8 instead. This camera is the first digital version of this legendary and venerable rangefinder system. The lenses are unbelievably good (and the prices match), and the image quality is top-notch, perhaps the best of any 35mm form-factor system. There were early teething problems with the camera, but Leica was quite responsive and continues to make improvements. I started with just the 50mm Summilux ASPH, which is perhaps the best general-purpose 50mm, and one of the nicest lenses ever made. I added a Voigtländer 15mm f/4.5 Heliar, a super-wide-angle lens which weighs just 105g! Later I bought a 35mm Summicron ASPH, which was replaced with a 35mm Summilux ASPH when I found this at a good price. A 75 Summilux followed for portraits, as did a 90mm Macro, 28mm Summicron ASPH and the wide angle Tri-Elmar. I also managed to find an old Visoflex III and a Bellows II, as well as a Telyt-V 280mm f/4.8, all very cheap. Finally, I added a 1939 35mm Elmar, for the old look. Due to a lack of use, I traded the 90mm macro for a 90mm APO Summicron, and I am much happier with this. I also sold the 280mm Telyt-V, which I just wasn't using. I am currently considering selling the Tri-Elmar and getting a 21mm Summilux instead, since I find the M8 workflow of the Tri-Elmar frustrating, and anyway, I have the Voigtländer 15mm. While my M8 was in Solms, I used a second-hand M6 with the famous Dual-Range 50mm Summicron, a great combination which I continue to use regularly. For both M6 and M8, I opted for the chrome versions, which I find stunning. My walk-around kit weighs perhaps half of what the 5D weighed, and it is also much more compact. The lenses for the M8 are coded with a 6-bit black/white code, and this code allows the camera to know which lenses are mounted. There is no electronic communication with the lenses, as in most DSLR systems. The codes are used to eliminate vignetting and cyan corners from infrared filter usage. Although Leica is converting lenses without codes at cost, the price still non-trivial, especially with shipping included. A group of forum readers at the Leica User M8 Forum, including myself, have been figuring out how the codes work, partly to experiment, and partly to apply to non-Leica lenses. I have been compiling a table with this information. For a long time, I had a Leica M8 photo-a-day blog here. What was once bleeding edge became bleeding awful. The Sony had a 2/3" sensor with significant noise at high ISO, chromatic aberration (purple fringing), vignetting at wide angles with large apertures, and barrel distortion at the widest angles. Since I often take pictures in the evening or in dim places, this put serious limitations on the quality of many of my photos. I also found out by examining my EXIF data that I used the widest angle (28mm) 30% of the time, and another 10% of my the pictures were taken at the longest setting (200mm)! This means that 40% of my pictures were taken at the limits of the zoom, with no possibility of extending the range. The straw which broke the camel's back (and my wallet) was that I found it almost impossible to get sharp pictures under normal conditions at all but the very widest focal lengths. Something clearly needed to be done. I looked at the follow-up cameras to the F828, but none of them had solved these issues satisfactorily, so it became clear that I needed to move to SLR (single-lens reflex) cameras to find a solution. I looked at the Canon EOS 20D for a long time, and briefly considered the then brand-new Nikon D200, but eventually settled on the relatively new Canon EOS 5D. The image quality was matched only by the exceedingly expensive Canon EOS 1Ds Mk. II, and Leica R8 or R9 with the DMR, and a few medium format data backs. Although I could have saved up for the 1Ds Mk. II instead, it weighs 1.5 Kg without a lens! I wanted something a little more portable (and didn't mind the savings). The Leica R system and the medium format backs were way out of reach. I bought the Canon EOS 5D, 24-105 f/4L zoom, 17-40 f/4L zoom, the 70-300 f/4.5-5.6DO zoom, as well as the 100 f/2.8 macro lens. The quality of the DO lens was a touch below the others, but it was to be my travel companion. The 24-105L and the 70-300DO lenses have image stabilisation, which can be a real lifesaver. I later added the EF25 II extension tube, which got me a little closer in macro photography. Later still, I was reading the Alternative Digital Systems & Lenses forum on fredmiranda.com, and decided to try one of the older Leica lenses with an adapter. These lenses are very sharp, and can be had for ridiculously low prices, if you are patient. Several Leica lenses later, the 70-300DO was gone, since I found I didn't use it much. I got some truly great deals on some of the Leica lenses, and they were very sharp wide open, which was a weakness of Canon lenses (this is a design compromise, but I prefer Leica's compromise). I finally got tired of struggling with the Nikon's confusing menus, deplorable battery life, and the by-then low resolution, and bought a Sony DSC-F828. The Nikon was one of the best prosumer cameras at the time it was released, but times had moved on, and the Sony was higher resolution, better quality, easier to use, and had all the features I had been looking for. Besides, with the 4GB microdrive I bought, it could take unlimited length 640x480 films at 30fps, with sound, or about 1100 pictures at 8 megapixel resolution. The bottom line is this: the camera sat well in the hand; the zoom was manual; the focus could be manual, but in fact the autofocus was quite good; the program mode was so good that I almost never found myself using manual exposure settings, and on and on. It was an improvement over the Nikon in every way, except two: it cost €900, and it was large and heavy! Some magazines really criticised it for its shape, or the noise at low light levels, but others went crazy over it and gave it top marks. To see Sony pictures, look in my travel section. Any images from may 2004 to february 2006 are taken with the Sony. In the spring of 2001, I was finally ready to try my hand with digital photography. 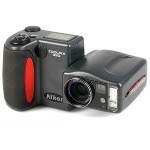 Some friends of mine had just bought the Nikon CoolPix 990, and I wanted one. It had sufficient resolution to print out an 8"x10" at a quality nearly indistinguishable from film, and the Nikon quality spoke for itself. The menus had many new and exciting features such as white-balance, and there was a little preview window on the back. To top it all off, it could make 45 second movies at 320x200! I have spent many great days taking pictures with this camera, and I can barely imagine ever taking pictures with a film-based camera any more, except perhaps the Hasselblad, which is its own world. To see Nikon pictures, look in the travel section, at the articles up to and including april 2004. Around 1996 I traded all my Olympus 35mm equipment (OM4, 28mm lens, 50mm lens, 80-210mm zoom, T32 flash, winder, filters, etc.) 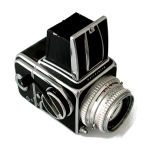 for a 1966 Hasselblad 500C with the 80mm f/2.8 standard lens. This was not really worth it. The Hassie is a great camera, but I missed the 35mm equipment pretty quickly, and in hindsight, I got very little for it. I should have purchased the Hasselblad outright, and kept both. With the Hasselblad, it takes so much longer to set up, to focus (which is very hard), to measure the light, and so on. It is very different than 35mm photography. I tend to take better pictures with the Hasselblad, but I take perhaps 1/10th as many with it. I do love it though. It is a truly gorgeous work of art, and has a great feel. To top it all off, the *kachunk* when you take the picture is deeply satisfying on a primal level. I don't expect I will use it very often, but when I do, I really enjoy myself. and the results are out of this world. Great care is needed focusing, to get maximum sharpness. A tripod is a must. 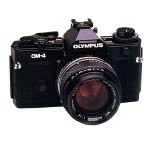 Around 1983 my OM2n was stolen. Sometime after that I bought an OM4 to replace it. The most important feature of this camera was the spot meter, which measured the light in a 2 degree cone, if I recall correctly, and if you pressed multiple times, it would average them, up to eight in total. At the end, you could press a button to tell the camera if it was really not a neutral grey region you had measured, but a highlight or shadow region, in which case it would compensate. It was a great little camera, but in the end it was the relatively low resolution and tonal-range of 35mm which made me trade it for a Hasseblad. In hindsight, I got so little in trade-in value that it wasn't worth it; I should have just bought the Hasselblad outright. 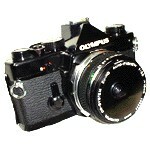 Around 1979 I saved up for and bought an Olympus OM2n, a camera good enough to be used by many professionals. I cannot for the life of me remember how I managed the price, and suspect that various family members contributed secretly or not so secretly. I loved the camera to death and took many, many pictures with it, on various trips. I had a 28mm wide-angle lens, an 80-210mm zoom lens, a T32 flash and 2.5 fps winder for it. Eventually it got stolen by someone who broke into my school locker sometime in 1983, if I recall correctly. I always loved the small yet clean designs of the Olympus cameras, and didn't accept the compromise of the clunky Nikon F3 and Canon F1 which were the competition at the time.